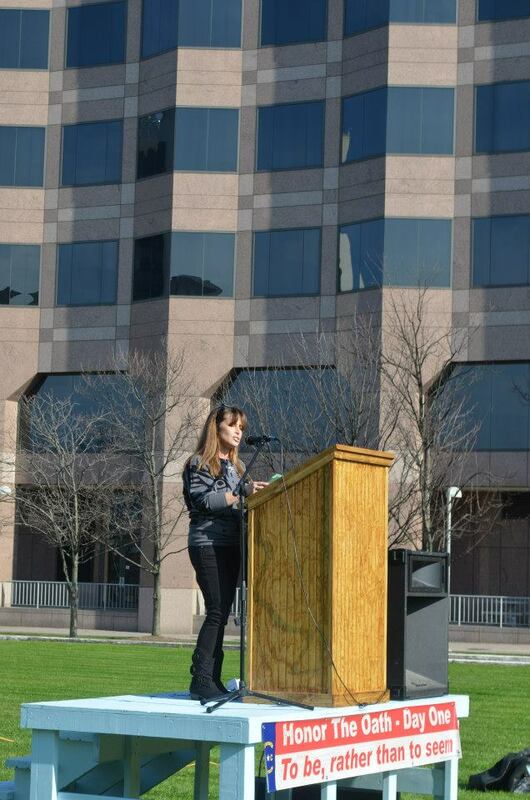 On January 9, I spoke at the “Honor the Oath” Rally in Raleigh, NC, organized by the Carolina Liberty PAC and a former NC state legislator. That was the day that members of the NC General Assembly took their oath of office. The rally was intended to invite citizens to Raleigh to celebrate the start of the new legislative session, witness the swearing of the oath ceremony, talk to their legislators (especially about the health insurance exchange situation), and to listen to the remarks of various grassroots organization leaders, state representatives, Congressman Walter Jones, NC GOP chairman Robin Hayes, and concerned citizens. It was a beautiful day for an outside rally. In fact, it was a perfect day – warm and sunny, with free lemonade available for everyone. Everyone was happy and excited to come together, celebrate the occasion, and listen to one another profess their love and allegiance to the state of North Carolina and their commitment to honest and constitutional government. The following is the transcript to my remarks at the rally. This afternoon, several groups have come together to celebrate the start of the new state legislature and to remind our elected officials to honor their oath. The rally was organized by the Liberty movement. Speakers include those from the Liberty Party, the Republican Party, the Tea Party, and the Tenth Amendment Center. I hope going forward we will all learn to appreciate each other’s priorities and learn to work together – for the common good. All of our groups play an important role in the big picture. Republicans are the solid block that continues to provide the political power for conservative values. The Tea Party highlights and educates on constitutional violations. Liberty groups remind us that freedom is inextricably linked to a limited government. And the Tenth Amendment Center focuses on solutions. We are part of the beautiful pie that wants to reclaim America. It’s a great honor to be here today to talk about the importance of honoring the Oath of Office. Like 2010, 2012 was another historic year where the people of North Carolina showed their determination to become active in their state government and help determine the direction of the state. First we became educated, because we know the one indispensible tool of good government is knowledge. (James Madison wrote that “a people who want to be their own governors must arm themselves with the power which knowledge gives.”) Next, we identified disciplined conservative candidates, and then we put our personal lives on hold to work to get them elected. And most of them did. The historic election results speak to what we can accomplish when we educate and energize. But our determination to have our voice – our real voice – heard in government didn’t end at the ballot box. Now we are up here to remind those who have been elected to make good on their promises and to honor their oaths. But make no mistake, we have no intention of blending back into the scenery or going away. There’s too much work to be done. But for now, for today – this next step in representative government – the Oath of Office – is very important to us. “I, ___________, do solemnly and sincerely swear that I will support the Constitution of the United States; that I will be faithful and bear true allegiance to the State of North Carolina, and to the constitutional powers and authorities which are or may be established for the government thereof; and that I will endeavor to support, maintain and defend the Constitution of said State, not inconsistent with the Constitution of the United States, to the best of my knowledge and ability; so help me God.” (§ 11-7). What happens – symbolically – when a representative takes his or her oath of office? It ceremonially transfers the sovereign powers of We the People to that representative so that he or she can govern on behalf of us. It is a transition of power, all the while forcing that representative to solemnly promise to abide by the limits of that power, as set out in both Constitutions. It reminds the representative that he is a servant of the people and not an agent of the government. He is an agent of the People. The oath of office for representatives and the Governor are examples of promissory oaths. The oath is a declaration of intent, invoking the name of God so that He may witness that promise. As Chapter 11 of our NC General Statutes explains, it is a solemn appeal to Almighty God, as the omniscient witness of truth and the just and supreme avenger of falsehood. It is a religious act by which the representative invokes God not only to witness the truth and sincerity of his promise but also to avenge his imposture or violated faith. In other words, the oath-taker invites God to take notice of any breach, should that happen, and punish him as he sees fit. Oaths are given and taken so seriously and solemnly because they are crucial to the end of good and honest government. We want our representatives to use their power responsibly…and constitutionally. As we know, Constitutions are based on certain bedrock American principles and one key principle is government restraint. After all, the American experiment can be summed up in one simple equation: “Limited Government = Maximum Liberty.” In fact, one of the features of our Constitution – the Bill of Rights – was incorporated as a specific check on government power. But a Bill of Rights was a constitutional feature even before the US Constitution. It originated with the states. Virginia was the first to enact a constitution that was prefaced with a formal “Bill of Rights.” That was June 2, 1776 and it was written by George Mason. It was called the Virginia Declaration of Rights. Not only would this crucial charter of freedom serve as the inspiration for Thomas Jefferson’s Declaration of Independence, but it also served as a template for all the other states, including North Carolina. When Jefferson’s Declaration of Independence was adopted by the Continental Congress on July 4, 1776 and when North Carolina received the news that the colonies had formally declared their independence from Great Britain, one of the first things she did was to write a constitution. And in that first constitution, state legislators incorporated 25 guarantees of personal freedom so that the constitution would complement the Declaration of Independence. Most of those guarantees are still in the current state constitution. They are the NC Declaration of Rights. A Bill of Rights is a statement of sovereignty. It is not an agreement, a contract or a conditional grant. It is a statement of common Natural Law. It acknowledges that all men are born equally free and independent, and have certain inherent and natural rights – to life, liberty, property, security, and to resist oppression. It memorializes the notion that individuals cannot, by any compact, Constitution, government, or government action, be deprived or divested of those rights. The US Bill of Rights was meant to prevent a repeat of the abuses that compelled our forefathers to take up arms against Great Britain. It was meant as a shield to protect the people against tyranny, so that the sacrifices and bloodshed by our forefathers would not be in vain. It was not individual freedom that the states wanted. That’s not what North Carolina wanted. After all, under the American system, all men were created with inalienable rights that come from our Creator and not government. No, our Founders and state leaders wanted freedom from government. The Bill of Rights doesn’t grant rights. Rather, it recognizes rights. It requires that the government not interfere with those rights. In other words, our Founders and state leaders wanted constitutional liberty. They figured if such limitations were incorporated into the Constitution, courts will be especially protective of those rights and will safeguard them against every attempt by the government to violate them. Well, that’s what states like North Carolina and Virginia and others hoped for. It was a hopeful plan. The fact is that the plan was not the brainchild of the Federalists, who won the day at the Constitutional Convention in Philadelphia. It wasn’t the brainchild of James Madison, initially an avowed Nationalist. The Constitution was amended by the States because of the influence of the anti-Federalists – the ones who wrote volumes to criticize the proposed Constitution for concentrating too much power in a central government. North Carolina ultimately embraced the anti-Federalist position. She wanted a Union of states and not states United. One anti-federalist, the Centinel, reminded those who had to consider the merits of the Constitution that republican governments only work well and are successful in relatively small territories. And so the Centinel warned: “It is not practical to establish and maintain one government on the principles of freedom in so extensive a territory. The only plausible system by which so extensive a country can be governed consistent with freedom is a confederation – or federation – of republics, possessing all the powers of internal government and united in the management of their general and foreign concerns….” In other words, a Union of independent republics. A Union of Sovereign States. In the end, the Bill of Rights was adopted to further limit the power of government. In the end, the ant-Federalists won the day. North Carolina got her way. If there is ever any doubt as to the intent of the Bill of Rights, we need only consult its Preamble: The Preamble to the Bill of Rights says that the states adopted the set of amendments expressly in order to prevent any misconstruction or abuse of government powers. In fact, the Preamble calls the amendments “Restrictive clauses.” The Bill of Rights supersedes all other parts of our Constitution and restricts the powers delegated under the Constitution to the government. While amendments one through eight (1-8) have some historical context, stemming almost verbatim from various British compacts/charters, the Ninth and Tenth Amendments are uniquely American. North Carolina’s Declaration of Rights is found in the first section of her constitution, in Article I. It declares and protects the rights and interests of its citizens, even though minimum protection is already afforded by the US Constitution. And that minimum protection is being eroded. Washington DC too often uses a skewed perspective. Instead of asking: “Are citizen’s rights being violated by this law?” government asks: “Is the violation of citizen’s rights justified because of an important government objective?” And too often the answer all three branches give us is “yes.” When our rights get in the way of a government objective, we lose. We lose the very reason we need the government in the first place. Government has too many objectives, including unconstitutional ones. Taking note of what is going on at the federal level, we have to be reminded that part of our state representative’s oath is to support the US Constitution. As a citizen who wants her God-given rights protected, I urge our representatives NOT to take the skewed approach of Washington DC and ask the proper question: “Are citizens’ rights being violated by the particular federal law.” And if they are, the oath would require them not to support that piece of legislation. I stand here to ask our leaders to Honor their Oath as a Republican Woman, as a Tea Party leader, as the Deputy Director of the NC Tenth Amendment Center, and as an ordinary citizen. As a Republican Woman, I know that government is best when it governs least. I know that government is best when it is closest to the people and NOT controlled by an intellectual elite that is centered in the far-distant capitol of Washington DC. I have confidence that people can plan their lives better than the government can plan them. I have more faith in human beings than the government does. As a Republican Woman, I know that too many laws can destroy liberty just as effectively as having no laws to protect it at all. I also know that religion and marriage and other conservative institutions are crucial to society. Like moral virtue, responsibility is first learned within the family and in the home, often by children imprinting on their parents. Only a people who are moral, religious, and righteous require limited government. And only such people can be trusted with a representative government. As a Republican Woman, I know that the US Constitution is an agreement, signed by the States, on behalf of We the People, and it must be interpreted according to the spirit and intent under which it was signed. What it meant in 1787 and in 1791, when the states signed it, is what it means today. Can you imagine a reasonable person entering into an agreement of significant consequence without knowing how that agreement will be changed or interpreted in the future? No party would enter into such an agreement – especially with such enormous consequences as the States did in 1787. After November’s election and the results at the national level, I had to remind myself why I got involved in the Tea Party movement. We all remember when the Tea Party started back in 2009. CNBC correspondent Rick Santelli was on the floor of the Chicago exchange when he went off in a tirade over the government’s stimulus plan and bailouts. He said it wasn’t the government’s job to use taxpayer money to keep people in their homes when they couldn’t afford those homes in the first place. He was lashing out at a government which was expanding into areas it had no business being in, especially when its actions were going against the very nature of free markets. He called for a Chicago Tea Party. His rant was contagious. It touched a nerve… sort of like when the colonists protested the King over “No Taxation Without Representation.” Santelli’s use of the term “Tea Party” reminded us of a time when ordinary citizens stood up for their rights – peacefully – against a government that was growing intolerant of those rights. That’s why I joined the Tea Party. What keeps me loyal to the party is the history of this state, which is reflected proudly on our state flag. The flag has 2 dates on it – May 20, 1775 and April 12, 1776. The first honors the signing of the Mecklenburg Declaration of Independence and the second honors the signing of the Halifax Resolves. On May 20, 1775, Mecklenburg, NC was the first government body in America to declare independence from the Crown of England. This document preceded Jefferson’s Declaration of Independence. On April 12, 1776, the provincial Congress of North Carolina met at Halifax and voted to authorize its delegates to the Continental Congress to vote for independence from Great Britain. We were the first state to take that bold step and issue such instructions. A few years later, in 1780, Britain’s Lord Cornwallis invaded North Carolina. He passed through Charlotte but was too afraid to stay, saying that it was a “hornet’s nest of rebellion.” His experience there would be recorded as one of his most humiliating experiences in the Revolution. After fighting in North Carolina, Cornwallis would be too weak to fight on. He would go on to be defeated at Yorktown and each colony would go on to be recognized as an independent state by the British crown. In 1788, while the state of Virginia (the home of Thomas Jefferson, James Madison, George Washington, and Patrick Henry) proposed twenty alterations to the Constitution and a separate Bill of Rights consisting of twenty items, North Carolina still wasn’t satisfied that the federal government was sufficiently limited. It wanted an additional six amendments. In December 1860, South Carolina seceded from the Union and 4 months later, Lincoln forced the first shot by the Confederacy at Fort Sumter. In March 1861, Lincoln then sent a letter to NC’s Governor John Ellis and demanded 75,000 troops to subdue the states that had seceded, calling them “rebellious.” Governor Ellis promptly replied by telegram, stating: “I regard the levy of troops made by the administration for the purpose of subjugating the states of the South as a violation of the Constitution and as a gross usurption of power. I can be no party to this wicked violation of the laws of the country and to this war upon the liberties of a free people. You will get no troops from North Carolina.” North Carolina did not intend to secede from the Union. But given the choice between being forced by President Lincoln to take up arms and use them on its southern neighbors (which had seceded peacefully), it chose to respect the freedoms laid out in the Declaration of Independence and sever its political bonds with the federal government. North Carolina has a proud history of standing for freedom and standing up against government oppression. I was born and raised in New Jersey but I am so proud to call North Carolina my home now. Many of you know me and know how much I love it here. Which is why I was honored to be asked to join the Tenth Amendment Center and be involved in projects to help her restore her power, sovereignty, and pride. As a member of the Tenth Amendment Center, I believe power has been usurped from the states and from We the People and it needs to be restored. I believe that the Ninth and Tenth Amendments hold the answer to our future success as a free state and a free nation – just as our founding state leaders believed. I believe that an oath to the US Constitution is an affirmation of these amendments and a duty to assert them whenever an encroachment by the federal government threatens their integrity. I believe Obamacare was one such encroachment. I believe that in order to honor the oath, our representatives must opt out of any health insurance exchanges. I ask: Why did North Carolina fight so hard and protest so strongly for a Bill of Rights – specifically, for the Tenth Amendment – if it doesn’t plan on standing behind them. Third – The states, not the federal court system, must provide the mechanism to invalidate unconstitutional laws because the courts will never do it. The Supreme Court has been a willing accomplice, for too long, in permitting the gradual and continuous expansion of government power. As a member of the Tenth Amendment Center, I know that the Supremacy Clause has limits to its protection. Not everything the federal government does is supreme law. That would be tyranny. It’s bad enough that with the government’s heavy-handedness in the economy, with its take-over of certain industries, and with its massive interventionist policies, we already have strong elements of fascism in our country. Our legislators must not shirk their responsibilities and allegiance to our state because of a misunderstanding of the Supremacy Clause. We must never hear a state legislator say that it is not their job to second guess the decisions of the federal government….. It absolutely is. If they don’t, then we will continue to lose precious liberties to a government that thinks its objectives are more important than we are. As a member of the Tenth Amendment Center, I know that the Civil War did not destroy states’ rights, as some of our legislators believe. All the Civil War did was settle the issue of slavery and force the South back into the Union. Despite no major battles being fought in our state, North Carolina sent more recruits than any other Southern state to fight for the Confederacy – for the right of self-determination. One in every 7 soldiers that lie dead on the battlefields of the Civil War was a North Carolina son. Their sacrifice will have been completely in vain if we abandon the notion of state sovereignty. Looking at things from a state sovereignty point of view, saying that Lincoln saved the Union by winning the Civil War is like saying a man saved his marriage by beating his wife into submission. Any legislator who says that the Tenth Amendment has been minimized by the Civil War or honestly believes that the issue of states’ rights has been decided by that conflict should be tossed out. The campaign to remove them in the next election should start immediately. So now you know why I’m standing up here and why I feel passionately about the Oath of Office. Knowing the limits of power under the federal Constitution and knowing the objects of good and honest government in our state is what we expect from our representatives. This is a critical first step towards preserving American liberty. Only then can their oaths actually mean something. I’ll state the pledge first and then we’ll all take it together.